Want a sports car that won’t rip your head off? The new two-seater Abarth 124 Spider Roadster is a rear-wheel-drive Fun Machine that drives well and sounds awesome. If you can get over its practical deficiencies, it’s certainly a car to get excited about. Those practical deficiencies include a small cockpit and a small boot. But let’s face it – we buy cars like this for their raw power and ability to put a massive smile on our face. Even just looking at this car as it sits in your drive is enough to make you grin from ear to ear. For those who are happy with a 0-62 time of 6.8 seconds, it’s a classy choice. That said, is it better than a Mercedes? 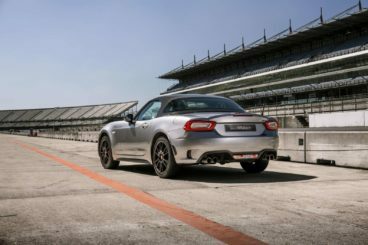 OSV finds out with our 2018 Abarth 124 Spider Roadster review. Being rear-wheel-drive automatically means that the 124 is going to be a lot of fun to drive. It’s also nice and light, which allows for a thrilling driving experience matched by few others in this sector. Two of those cars that can match it are the Mazda MX-5 and the Fiat 124 Spider, and this is because all three cars share the same mechanical bits and pieces. However, the Abarth benefits from tweaks to its suspension setup and steering so that it’s even more precise and engaging. Body lean is kept in check, and while the ride is on the firmer side it never feels too uncomfortable. There’s lots of grip on offer, and we’re pleased to say that limited slip-differential comes as standard. This helps the car to pick up speed as you emerge from a slow corner, and it will also give you the confidence to be a bit more daring with your driving. It’s also worth mentioning that the Abarth 124 isn’t intimidating for a sports car. In fact, it’s easy to live with in towns and cities, although if we have one criticism it’s that it can get a bit too noisy at times. Its bombastic exhaust is fine when you’re in the mood, but a bit of a headache when you just want to chill. In terms of its engines, there’s just the one available. This is a turbocharged 1.4-litre petrol engine that develops 168bhp, and which has a 0-62 time of 6.8 seconds. Buyers can choose to pair it up with either a 6-speed manual gearbox or a 6-speed automatic. A 0-62 time of 6.8 seconds is miles off Porsche 911 territory but will suit those of you who want a less daunting sports car experience. Moreover, it’s faster than the Mazda and the Fiat by some distance. This Abarth is a classy two-seater that looks very similar inside to the Mazda MX-5 and the Fiat 124. To properly enjoy it, you do need to be under six feet tall. If you’re taller than that, it’s going to be a struggle when the roof is up. Although it’s cramped (or snug), the car’s cockpit is beautifully put together and affords you a wonderful view of the road ahead. The pedals are in the perfect position, while the steering wheel is a joy to use. We like the dashboard too, although it’s identical to the one in the Fiat and Mazda. It also gets the same infotainment system. The seats are different at least, with this car adding slatted cushions and a scorpion badge on the headrests. In terms of overall quality, meanwhile, the Abarth outdoes a lot of its rivals with the sheer amount of soft-touch plastics. Is the Abarth 124 Spider Roadster practical? There isn’t more than meets the eye to this one – it’s about as practical as it looks. There are just two seats and space is at a premium for the driver and their passengers. Headroom, in particular, is limited until you drop the roof. The car lacks a glovebox and storage solutions, in general, are sparse, while it’s easy to bash a cup holder with your elbow. The boot, meanwhile, measures just 140-litres, comes with a big lip and a narrow opening, and can’t be extended. There’s only one trim level available and standard kit is okay. The Abarth 124 comes with climate control, Alcantara upholstery, a digital radio, Bluetooth and cruise control. The automatic gearbox, meanwhile, cost £1,500 to add, while other options include a 9-speaker Bose stereo and sat-nav. In terms of how safe the car is, it hasn’t been crash-tested by Euro NCAP. 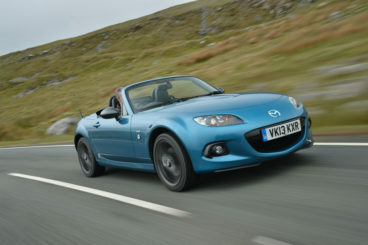 Its sibling, the Mazda MX-5, was crash tested and scored 4/5. That’s not too bad, and standard safety kit here includes electronic brake force distribution, electronic stability control, tyre pressure monitoring and anti-lock brakes. Prices for the new car start at £28,826. For more information on our leasing deals, you can check out our page here. In terms of its running costs, there’s just the one petrol engine available. It’s small and the car doesn’t weigh much, all of which contributes to good fuel economy. On a good day, you could return as much as 44mpg, while emissions are as low as 148g/km of CO2 if you stick to the manual gearbox. With prices starting out from under £30,00, it’s a really accessible sports car. It’s not intimidating but you can still have lots of fun. Once you fire it up, the engine cackles and fizzes and gets you in the mood. Many sports cars are impractical, but few are this bad. Space is tight when the roof is up and the boot is almost a write-off. There are always questions to be asked of sports cars that aren’t tested by Euro NCAP. What weakens the Abarth 124’s case is that the car on which it’s based, the Mazda MX5, was crash tested – and scored 4/5. Let’s see how the car fares against its rivals in the comparison section of our 2018 Abarth 124 Spider Roadster. Mazda is well-known for producing affordable and accessible sports cars for the everyman, and the new Mazda MX5 Convertible is another fab offering. On the road, we have to give it 5/5 for the way it performs. It’s just so much fun. It’s light, its steering is nicely weighted, and it feels balanced in bends. If you opt for the Sport trim, the ride will be harsher, but this model is almost as sharp and engaging as a Porsche. All models come with a 6-speed manual gearbox as standard, and while there’s no automatic option available, that’s hardly a problem – this manual ‘box is a pleasure. In terms of its engines, there are two petrols on offer, starting with a 1.5-litre unit. With no turbocharger in sight, this engine produces 129bhp and has a 0-62 time of 8.3 seconds while revving furiously. A bigger 2.0-litre petrol engine tops you up with an extra 29bhp and completes the 0-62 sprint in 7.3 seconds. Running costs? The 1.5-litre engine is the most frugal, managing 46.9mpg on a good day while emitting 139g/km of CO2. The 2.0-litre unit is good for 40.9mpg at best and emits 161g/km. Inside, the MX5’s cabin is similar to the Mazda3 Hatchback. While that car is aimed at families with kids, its interior works just as well here. The quality is higher than last time, and there are more soft-touch plastics. Of course, there are crucial differences between the two cars, with this one coming with a low-set driving position that enhances the car’s sportier personality. It also comes with a lower roof, with the result being that you either feel cocooned like a racing driver – or cramped. Is the Mazda MX5 Convertible practical? It’s got just the two seats, which should tell you right away that it’s not going to be the most practical car you’ll ever buy. Its doors at least open wide for easy access, and as long as you’re under six feet tall you’ll feel nice and snug. The steering wheel doesn’t adjust for height, and neither does the driver’s seat. This will really count against the car, while the boot measures a meagre 130-litres. The new Mercedes SLC Convertible is slick, luxurious, and works well as a comfortable cruiser. With Mercedes focusing on relaxation more than anything else, the SLC probably isn’t quite as entertaining as the Abarth – but it is faster. That said, it’s still pretty agile and, thanks to its Dynamic Select System, it can take corners well. Body lean is kept to a minimum, there’s lots of grip on offer, but the steering is too light and too vague. In terms of its engines, a 2.1-litre diesel unit powers the 250d model. It develops a healthy 201bhp, comes with turbochargers, and can complete the 0-62 dash in 6.6 seconds. However, we reckon most buyers will take a keener interest in the petrol models. A turbocharged 2.0-litre unit powers the SLC 200 model, developing 181bhp and motoring its way from a standstill to 62mph in 6.9 seconds. A 300 model, meanwhile, develops a hearty 242bhp and sprints from rest to 62mph in 5.8 seconds. An AMG model rounds things off with 362bhp and a 0-62 time of 4.8 seconds. Running costs? The sole diesel is the economic champion, returning 64.2mpg on a good day and emitting 114/km of CO2. The SLC 200 petrol engine is good for 43.5mpg, but the bigger SLC 300 is the most frugal of the petrols, returning 46.9mpg at best. Inside, it would be easy to expect the Mercedes to blow the Abarth out of the water – but it doesn’t. As expected, it’s a polished cabin that comes with a number of luxuries, from new dial to round metallic air vents, but it’s dated and doesn’t look much different from a decade ago. A big infotainment screen is at least new, but while the centre console is easy to use, it’s old and cluttered. 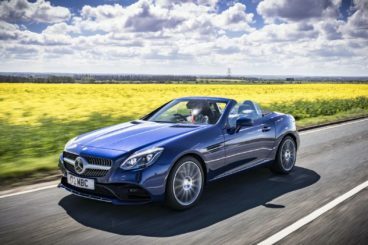 Is the Mercedes SLC Convertible practical? It’s got just the two seats, visibility is poor and while the glovebox is a good size, overall storage is a bit lacking. On the whole though, this is a useful car. The two seats offer lots of room, parking sensors are standard, and the boot measures an impressive 335-litres. That’s way bigger than the Abarth – and it’s also bigger than a Ford Focus Hatchback! When the roof is dropped, however, you do lose 90-litres of boot space. This is a riot of a car – and it’s super affordable and accessible. Not as fast or furious as a Porsche Carrera, but still more fun and less expensive than a Mercedes, it’s the ideal sports car for those of you who don’t want to take things to the extreme. The Abarth 124 Spider Roadster looks great, drives well, boasts a classy cabin, and is well worth a shot.